Peter Berg produces and directs “Battleship,” a terrible action-adventure that unfolds across the seas, in the skies and over land as our planet fights for survival against a superior alien force. Possibly, the worst film of the year, Battleship fails across the board. The story follows Taylor Kitsch as Lt. Alex Hopper, a Naval officer assigned to the USS John Paul Jones; Brooklyn Decker as Sam Shane, a physical therapist and Hopper’s fiancée; Alexander Skarsgård as Hopper’s older brother, Stone, Commanding Officer of the USS Sampson; Rihanna as Petty Officer Raikes, Hopper’s crewmate and a weapons specialist on the USS John Paul Jones; and Liam Neeson as Hopper and Stone’s superior (and Sam’s father), Admiral Shane. In terms of screenplay, directing, soundtrack and casting Battleship is literally quite disgusting. A cheesy storyline is never a good sign as it means there is almost always cheesy writing, which is frankly unbearable. Even the action scenes in this film lack imagination and for any filmgoer seeking energy escapism, you’ve been terribly misinformed, as Battleship cannot even reach the level of an actual film, but rather an annoyingly long infomercial on the Navy and what the Navy does when attacked by extra-terrestrials. This film was destined to be horrible as soon as Rihanna was casted but in the end, we can logically come to the conclusion that even she, was not the worst actor. Yes, I know I sound completely mad but I think I am right; Rihanna has, most surprisingly put in an incredibly sub-standard performance, but her peformance far exceeds what I was expecting. In reality, I would say that the worst actor is a toss-up between Taylor Kitsch and Liam Neeson, who put in laughably bad performances. I was most disappointed in Liam Neeson’s decision to involve himself in this, despite the big bucks offered- I completely lost respect for him. So, even those who go to films looking for escapism and unrealistic fantasy, do not be tricked by Battleship, as it doesn’t even fit the viewing criteria of a donkey. I just hope that your view of the Battleship board game is not in any way affected by this film, as the board game, far exceeds the film in terms of intelligence. My vote for the worst movies of the year. Despite having one of the most ridiculous names in cinematic history, Tinker Tailor Soldier Spy is actually an excellent film. Set in the early 70s, British espionage is in a state of crisis. An operation in Hungary has gone wrong and Control (John Hurt), dying head of intelligence agency The Circus, has been forced out, taking his deputy Smiley (Gary Oldman) with him. With Cold war tensions with the Soviet Union at their absolute peak and suspicions of a mole operating at the highest levels of The Circus, the board is set for a suspenseful thriller. Smiley is called back to put together a secret team to uncover which one of the four men at the head of The Circus is acting as a mole for the Russians. Unlike the current stock of thrillers in cinematic society today, Tinker Tailor Soldier Spy, which I will shorten to TTSS for convenience, doesn’t need to have overblown gun fights to have you on the edge of your seat. This is the major reason as to why TTSS is so enjoyable. The intense complexity and intelligence of this film ensures that the viewer’s intelligence isn’t insulted, which is a big step up from the current stock of thriller films. The characterisation in this film is quite superb as the depths of human deceit and cunning are explored in some memorable performances, especially from Oldman and Colin Firth. A well-chosen cast and witty writing covers the fundamentals of a good thriller and TTSS takes it all on from there. To be honest, there was a few niggles and a few patchworks here and there, but they were quite easy to happily ignore as you watched the rest of the film. Depicted with a form of intelligent storytelling, TTSS reminds us once again that dramas can be compelling and stunning without a cascade of explosions. Creating a third MiB film was a real risk. Having created two incredibly witty and hilarious films prior to the current film, many fans of the franchise, including myself were quite nervous as to how this new addition to a much-loved series would turn out. Thankfully, it wasn’t horrible. But it wasn’t quite on the same level as its predecessors. As a matter fact it was far off it. In the new MiB film, an alien criminal kills the young Agent K(Tommy Lee Jones) in 1969, altering the timeline, changing the Agency and placing the Earth in danger. Hence Agent J (Will Smith) must travel back in time to 1969 to before the murder and work with the young Agent K (Josh Brolin) to save him, the Agency, the Earth and humanity itself. The storyline sounds OK-so far, so good. A perfectly executed directorship would ensure a sequel rivaling MiB 1 and 2. But that is as far as it goes. It isn’t perfectly executed and is lacking much of the unique vibe that accompanied the first film. It’s not that Men In Black has lost its appeal, its just that people have lost the ideas behind MiB’s appeal. In terms of acting, it was really a mixed bag. Tommy Lee Jones as Agent K is predictably perfect, playing his character as well as he did in the first two films but I feel it is Will Smith’s portrayal of Agent J that doesn’t live up to expectations. Smith’s positive, slightly hyperactive screen presence in the previous films is lacking here, and seems much more like a predictable Hollywood actor. This is probably one of the most disappointing parts of the film, as Will Smith is a good actor, so its all the more obvious when he isn’t acting as well. On a positive note Josh Brolin’s portrayal of the young Agent K is surprisingly good, injecting a fresh and interesting take on Agent K.
But before I finish, I would like to say that the film is not as bad as I making it look like, it’s just that this was such a good film franchise and it can be a bit frustrating when it gets fuzzed up. But then again, it could have been a whole lot worse and completely destroyed MiB’s reputation, so in the end, we can consider ourselves quite lucky. The incredible amounts of hype and promotion and the subsequent ‘rave reviews’ for The Avengers, the 2012 American superhero film, based on the Marvel Comic, is really an indicator of the sub-standard films people are ready to label ‘intelligent’ these days. Joss Whedon’s blockbuster follows the efforts of a group of superheroes(which include Hulk, Thor and Iron Man) to save the world from an impending invasion by the otherworldly forces of Loki, who happens to be Thor’s brother. This group of superheroes is quite dysfunctional, and much of the film shows the struggle behind uniting this distinct group. Loki, the villain in this film is Thor’s brother, who controls the Tesseract, a pulsing cube of energy that opens a gateway to the universe. Using the Tesseract, Loki intends to crush Earth into submission with an army of Chitauri,(basically, an army of alien mercenaries). Nick Fury of S.H.I.E.L.D. assembles the Avengers with the purpose of confronting Loki’s unstoppable army, but this highly dysfunctional group of superheroes must first learn how to achieve teamwork. I don’t really need to describe this film much further as you can probably see where it’s going; Nick Fury assembles Avengers because of a psychotic Asgardian’s desire for revenge on humanity- the Avengers don’t like each other so much because of their conflicting egos-somehow the Avenger’s unite and take on Loki’s army, so on and so forth. These action-flicks which pretend to be serious are pretty much the same; there are heroes, whose character’s are probed over lightly, there are villains who are villanised further and then towards the climax of the film there is a cascading of special-effects intended to overwhelm the viewer and make them forget how stupid the film really is. So, this film is bad and that much is obvious. But the really worrying problem is that people have been sucked in by the hype or actually thought the film was intelligent. The incredible box-office success of The Avengers, which has seen it become the third highest-grossing film of all time shows us that people are starting to identify with the spiritual emptiness and cynicism that The Avengers is composed of. I love the movie How to Train Your Dragon. With endearing characters, spectacular action and a touching message, it is one of my favourite animated films of recent times. My favourite part of the movie, however, has to be the masterpiece that is John Powell’s score. Excuse the pun, but this spectacular soundtrack brought the film to new heights. The opening piece of the film, This is Berk, is an absolute delight, leaping from a moody intro to a blood-pumping frenzy of string, brass and chamber voices before cresendoing into an absolutely breathtaking string melody. Dense with rich layers and full-bodied themes, this piece feels like a story unto itself, conveying strength, whimsy and emotional beauty in just over four minutes. More stirring themes are introduced in Test Drive, creating a rousing sense of adventure and excitement, not to mention being the guiding force behind my favourite scene in the movie; when Hiccup first takes flight on Toothless. The rich melodies introduced in these two pieces echo throughout the score, played by strings, horn, piano and percussion. One of my favourite pieces on the album would be See You Tomorrow, with an infectious jig sure to get your toes tapping. The piece simply bubbles with playfulness and joy. Meanwhile, the tense build-up of strings in Dragon’s Den erupts into a bombastic barrage of excitement. Another gem is the soothing and beautiful Romantic Flight, which plays as the lead characters Astrid and Hiccup soar through the clouds. Now that I think about it, all the songs on this album are gems. 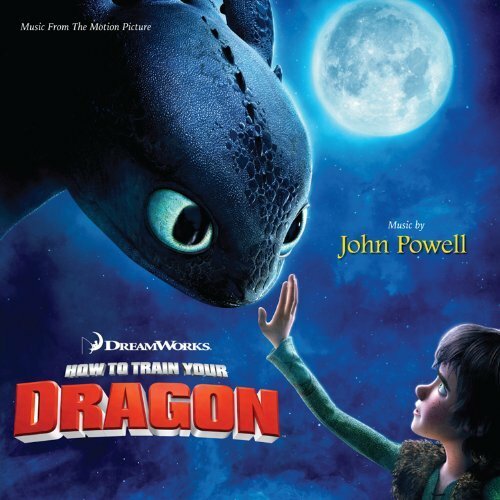 With How to Train Your Dragon, John Powell created a masterful score of incredible originality and wonder. This is music with exuberance and tremendous energy; the kind of music that just fills your soul with warmth. This is my favourite film soundtrack. Whether by YouTube, iTunes or The Pirate Bay, make sure you listen to this epic music. you leave the passenger alone. they are just a passenger. but now with a sky void of sun, forced to remember again. nevertheless as he sat there, his memory regained. he is not so bold, as to acknowledge such a crime. as he stares upon the blade, with-strained by godly might. it must be done now, if he is to find peace, he stands unbound. with nothing left there is no shame.